"local-E BAZAAR! 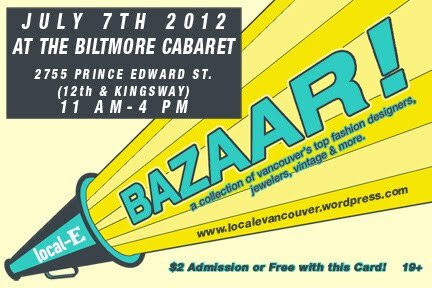 features over 20 local fashion designers, jewellers, vintage, hand-crafted leather work, men's soaps and more. The event takes place from 11am-4pm at the Biltmore Cabaret at 2755 Prince Edward Street, Vancouver BC (12th and Kingsway). This is a 19+ event with a bar, fun photo booth and food trucks outside." 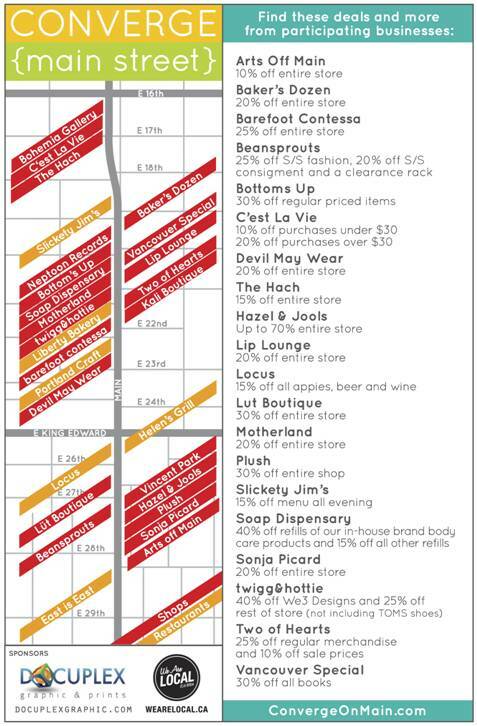 And on the evening of Thursday July 19th, Converge on Main will be taking place. Participating Main St. merchants offering special discounts anywhere from 10% to 70% off. Click the flyers to enlarge them and see more details.